We offer a variety of tires from Michelin®, BFGoodrich® and Uniroyal®. We offer a variety of different auto services including Oil/Lube Changes, Brakes, Wheel Alignments and more. 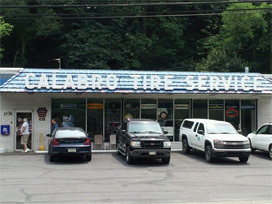 Calabro Tire & Auto Service offers a full line of automobile services and competitively priced performance and light truck tires from MICHELIN®, BFGoodrich®, Uniroyal®, and other major tire brands. Our tire professionals can help you make important tire decisions based on your specific driving needs—and our prices include free mounting, balancing, valve stems, and tire rotation.